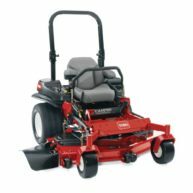 Z” Master G3 Mowers have been produced from the ground up and engineered to meet the demands and expectations of the fast paced modern world we all now live in. Large cutting widths combined with fuel efficient engines, ergonomic controls, operator comforts, accessories, serviceability and most importantly safety have all been considered in the Toro G3 line-up. Dependability has been reinforced with a 5 Year or 1200 hour warranty commitment on the units and two years on the engines. Clever redesign and knowledge gained from past models has produced a mower that has fewer parts, a lower centre of gravity and is stronger, safer and more serviceable than any mower of its size in the market today. Models are available in cutting widths from 48”, 52” & 60” and powered by the ever reliable Kohler Commercial engines. 25mm (1 inch) spindle shafts in cast iron housings.